Rachel is a 8 year old brindle female born in 2009. She was part of the population from the blood bank facility located in Cherokee, TX that closed in November 2017. Rachel is being medically evaluated by GALT's veterinarians and hopefully will complete her medical procedures soon. Rachel is not considered to be cat tolerant. Please check back periodically for updates on Rachel's journey to her forever home. 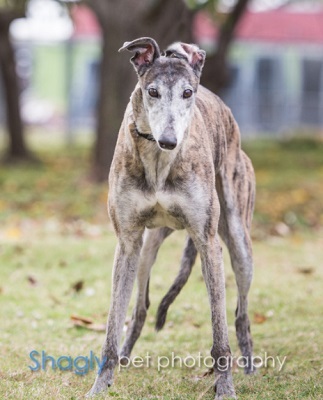 Older greyhounds are a well-kept secret in the grey community. I remember my first greyhound was Rachel's age when I adopted him. It was the best thing I ever did. He eased me into the world of greyhounds with his loving, yet spunky nature. Rachel reminds me of him. She is a lovely outgoing, yet quiet girl. She is very people oriented and enjoys being loved on. Independent in a good way, she keeps herself entertained with toys. Rachel will move to the front of my pack to be noticed - she enjoys being the center of attention. What is so endearing about Rachel is the way she approaches you while you're sitting to lay her head on your lap and gaze into your eyes - her eyes are beautiful and there's a story she seems to tell you with them. She is quiet and does not bark. She loves mealtime and this is probably her most favorite time of day. She goes outside into the backyard immediately after eating and this keeps her potty habits in good order. Also going out just before bedtime helps her to sleep through the night. Rachel has just been introduced to toys and she loves to collect them around her and play quietly, nibbling on them to hear the squeaks. Her ears are so cute as they go straight up when she hits the squeaker on the mark. She loves her dog bed and seems content to snooze for hours so you can get things done around the house. Rachel is a lovely grey who is so deserving of a loving home where someone has the time to spend with her. She gives three fold in return with her love, smiles and little kisses. 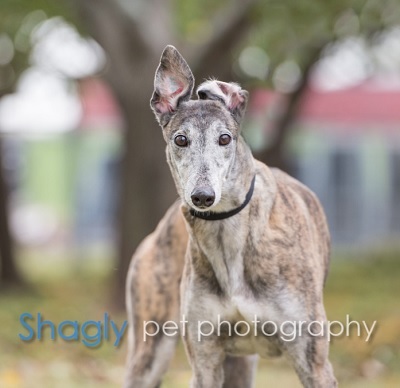 If you're looking for a quiet, sweet, loving grey - this is your girl!